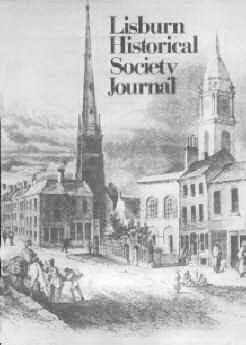 AFTER A BREAK of two years Lisburn Historical Society publishes this Journal which in its content includes articles whose themes are outside Lisburn, nevertheless when read, it will be agreed that they are of interest in promoting the theme of local history. June 1981 saw the opening of Lisburn Museum in the old Market House, more familiarly known as the Assembly Rooms and the first phase of the development is in that part of the building known as the "News Room" where the daily papers with weekly and monthly journals could be read, progressing from this, members of the News Room could have a game of billiards or snooker in the room which now houses the principal exhibition. The continuing development is looked forward to with interest. Later in 1981 saw recognition of a forgotten Lisburn man, Samuel McCloy, when an exhibition in December of this artist's work was mounted in the Museum. The opening was graced with the company of some of the artist's descendants of whom one, also Samuel McCloy, generously donated further works of his grandfather to the Museum. The Society continues to flourish on the staple diet of lectures and outings and in last Winter's programme, Lisburn Camera Club showed the film "Our Town" made by members some 20 years ago, which surprised and delighted all those who had the privilege of seeing it. There was no aspect of the town's life that was not covered and today this film must be regarded as a historical document. Of the outings, in May 1981 the Society were guests of Craigavon Historical Society at Waringstown as part of the Parish of Donaghcloney's Holy Trinity Church Tercentenary Celebrations. On this occasion Mr. Cooper of Craigavon Society spoke on the history of the parish and the church. In June of this year the members had the pleasure of visiting the home of Col. and Mrs. Rowan-Hamilton, Killyleagh Castle. Both these visits were regarded as high points, although this comment may be unfair as each and every visit made in the past two years is in itself of interest - they are a reflection of life. Finally, whilst we look at the large picture of Irish history in the Society's lectures and meetings, there is a need to look at our own area in greater detail for our attempts at the collecting of local information has not been developed to its full potential; there is a need for members to search out stores of local history in the area and put them on record.